For years we had talked about how to downsize and do more traveling, more adventuring, as a family. But a year-long journey in an RV after selling the family home and most of our earthly possessions? Sounded pretty cool. And also pretty crazy. Was it even remotely possible to make this happen at all? Let alone in just a few months as we imagined? This question stared us down as we, in turn, stared into the great unknown. In February 2017, this adventurous vision broke over our family’s horizon (carried by my wife, Julie) and we embraced it wholeheartedly. It was merely an exciting idea without specifics or form or sacrifice or sweat or dollar signs or struggle or pain or lost personal space or thousands of tiny-yet-exhausting decisions actually attached to it. Still pristine, undefined, unchallenged. And yet the vision lived and expanded. Mid-February 2017, my family and I stepped foot on an RV lot together for the very first time following some extensive online searching I had done in the prior week. A simple and unassuming beginning to a mind-bending and ridiculously quick process of shedding much of the life we had known together for 21 years of marriage. This isn’t how these things happen. At least that’s what I gather from speaking to some normal folks. It was far too fast, without nearly enough planning and number crunching involved. But in our blissful ignorance, we shopped and chatted and moved forward as if we belonged, as if we knew what we were doing and somehow were meant to be here. By early March, we had a 26-foot travel trailer parked at an RV storage facility in our Texas hometown. Step 1 had been accomplished in less than one month. And all human pulses simultaneously quickened in our home. We had moved beyond idle chatter and put this plan into action at neck-breaking speed. Was this outlandish plan really coming together? Was it still “supposed” to come together? Was everyone still on board as much as a month ago? And did any of that even matter??? This vision, this dream, had clearly taken on a life of its own at this point. What had been dragged and tugged and cajoled against all odds up to this point now began to pull us into orbit around itself and move us forward. Our doubts and fears and heart-stopping questions still orbited with us. But we moved forward, undaunted, into the next phase of this vision. Okay, that’s kind of a lie. To be completely honest, I had a few “shut down” days during this first month where my entire being was on overload and I couldn’t even form sentences. I was very daunted. I would stare and grunt and point. That’s about it. Julie suggested more than once that we just pull the plug on the whole RV idea because I was struggling so much with the unknowns of moving forward, with the fear of making a huge mistake. It was pretty scary and crappy, and I thought you should know about hiccups along the way. But I continued to put one foot in front of the other and by the end of March, we had prepared our family home for sale after countless hours of repairing and cleaning. The house hit the market March 31 and within 24 hours we had a full-price offer. Well, that was unexpected. Within a week, nearly a dozen showings and another full-price offer that we accepted. An early May closing date materialized before us. Our timeline for rolling out of town as summer hit in Texas moved one step closer to reality. Against all reasonable odds. We literally could not have scripted it any better up to this point (aside from my “mini breakdown”). And we watched as we orbited, slightly astounded at the unfolding story. And definitely exhausted. The month of April saw me post approximately 728 times on social media and Craigslist attempting to sell random possessions. 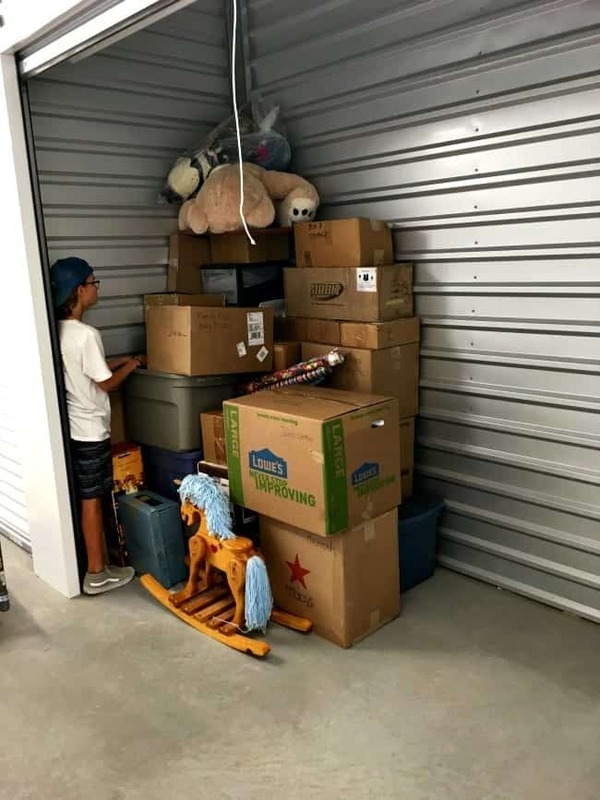 My son and I mixed in almost daily trips to Goodwill and other donation sites around town to offload the slew of cheap-but-still-useful items accumulated over the years. There may have been a garage sale or six thrown in there somewhere. Honestly, it’s kind of a blur. In May, the for sale posts and donation runs continued uninterrupted. But trips to the local waste treatment facility (aka landfill) also became necessary as we got down to the cluttered and hidden reality of our suburban family existence. At this point in the process, guilt was poking its prickly head into my business. Is it possible to come face-to-face with the spoils of your own “compulsive consumption” habits (thanks to The Minimalists for that useful term) day after day after day, hoping against hope for a merciful end to these appalling mountains of utterly forgotten stuff, and not be astounded? Not be ashamed? It’s one thing to be selling or donating things for other people to get some use out of. It may all still be your accumulated crap, but at least there is some redeeming usefulness left in it that allows it to be passed along, a salve for the painful and oozing sore of your consumption. But when you are down to the dregs of your possessions and you are up against a “move out clock”, those things have to get moved along somehow. Somewhere. And when far too many useful items end up filling a hole in our green earth, despite trying to just give it away first, it truly leaves a mark on the soul. Just as it does on the earth. I’m not proud of this and still feel the sting of guilt as I lay it out before you now. But there it is. And I deeply wish not to repeat that consumption pattern in the coming years. Despite all of this mess brewing internally, the work continued and we finally moved into our new “home on wheels” and slept there for the first time on May 26, 2017 parked beside my in-laws’ home just a few miles from the home we had just left. We were transported from spoken and barely-formed vision to full-blown reality (five people living in about 200 square feet and on the verge of traveling internationally) in about 3 ½ months. That’s utterly ridiculous, folks. It shouldn’t have happened. I am convinced that the only reason it happened is because our crazy vision was fully embraced by everyone involved. Our passion and excitement, even when mixed with fear and doubt and temporary paralysis, attracted all the right pieces and people and factors to breathe life into this unborn form. Forces beyond us were involved in making this happen. We simply brought our engaged selves, as completely as we could, without all the answers. In fact, with only a few concrete answers. We acted in faith that we were making the right move. And now I look back after more than four months, 4,600 miles and a slew of astounding national parks and beautiful cities in the U.S. and Canada experienced in our new home. This remarkable adventure is reminding me of the ultimate importance of embracing a strong and exciting vision for my life at all times. Living in an RV with your family for a year may not be an exciting vision for you; in fact, it may be your worst nightmare. It’s definitely not for everybody. But I believe that most of us in the American culture do need to find a way to break out of our consumption and accumulation patterns. Not just for the inherent benefits of that shift, but also in order to embrace some adventure. It is good for the soul. You can’t convince me otherwise. If you want to stop accumulating and start adventuring, the first step is to simply make the choice. Start crafting your adventure in your mind and then take steps to stop (and reverse) the accumulation of things that your life is currently orbiting around. And trust me: Your “adventurous vision” will be much easier to glimpse when the mountains of distracting possessions are out of your way. It may not happen all at once in a 100-day window like it did for my family…and, honestly, you probably wouldn’t want it to. But if you keep yourself focused on the direction you are moving, and not just the destination, it will be far more likely to all come together. And you will be far more likely to begin to see your own consumption and accumulation patterns clearly. You will change and grow as a result. So give thanks for today, even for the piles of stuff that you wish didn’t exist, but always dream of a better tomorrow. We should all dream of peace and adventure that we have not yet known, not just for ourselves but for everyone we come in contact with. We haven’t seen anything yet, and we know that the remotely possible is indeed very possible for you, if you believe. What Does a Typical Day Look Like for Full Time RV Life? 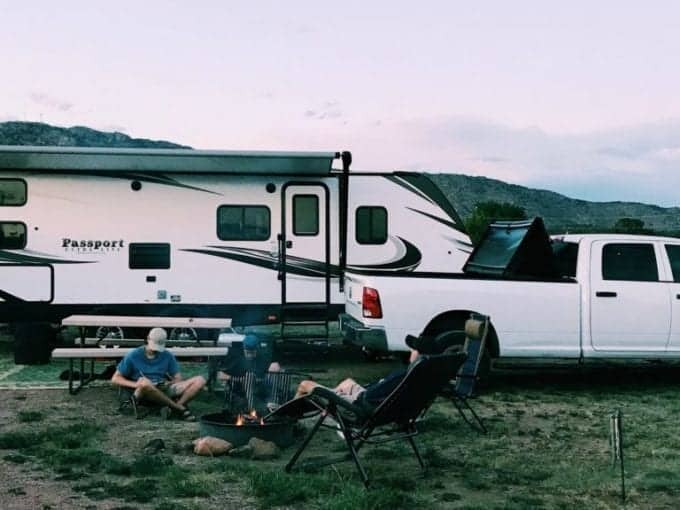 The 5 Hardest Things About Full Time RVing The Top 3 Reasons We Stopped Full-Time RVing Is Full-Time RV Living Right For You? putting our house on the market. Can’t imagine it selling in a week like yours did but that would be a challenge for sure. We look forward to begin our full time adventure in the fall. Thank you for your inspiration and the boost I needed today to sooth my apprehensions. I really appreciate your uplifting comment, because it is very important to me to feel that I am helping others to move forward in the face of fear and uncertainty. Along with the overwhelm, those two will never disappear during a major transition like this. But they cannot win, they cannot dictate next steps. Not in this area of life, and not in any other. We wish you nothing but the very best in your upcoming transition. If I am interpreting your comments correctly, it sounds like you are already very familiar with RVing (as Snowbirds), so you have one less major piece of the transition to navigate (logistically and financially) than we did as RV newbies. Bonus! Happy Trails to you! Keep on TREKKN.